For the next 10 hours, every dollar you give to Chabad of Seagate will be matched by extraordinary benefactors to reach our goal of $300,000! Twenty-eight years ago, Rabbi Chaim and Rivka Brikman were hired as the rabbi and rebbetzin of Congregation Kneses Israel of Seagate, a synagogue with a storied past dating to 1924. The synagogue had always prided itself on being a place in which every Jewish resident of Seagate would feel at home, so the Brikmans’ Chabad philosophy of warmth and outreach to every Jew was a natural fit. In keeping with their mission––they are shluchim, emissaries of The Lubavitcher Rebbe––the Brikmans founded a Hebrew school that has provided an authentic and state-of-the-art Jewish education to generations of Seagate children, and they created programs for children, teens, adults, and seniors, transforming what was a relatively small Jewish community into one that is vibrant and brimming with Jewish pride. Eleven years ago, because their synagogue building sufficed for the congregation’s needs at the time, the congregation rented their adjacent building to a Satmar school, UTA of Boro Park. As the community grew, however, the congregation needed the space for all their ongoing services and programs, and chose not to renew their tenant’s lease on the school building after it expired. While verbally agreeing to vacate at the end of the school year, the tenants reneged on the agreement, fabricating a lawsuit against the synagogue––the first step in what would become a pattern of deceit by the erstwhile tenants. A court settlement required UTA to vacate the premises at the end of the following year, but they flouted the court order and brought a new lawsuit challenging the congregation’s right to its own synagogue. They teamed up with a former president of the synagogue, who had been voted out by an overwhelming majority. In the past few months, UTA (Gary Schlesinger) hired armed guards to station themselves in front of the synagogue to stop community members from entering it, restricting the community’s use of its own building. They went as far as to insist in court that Rabbi Brikman should be arrested for hosting a Shabbos Kiddush in the building. They are well aware that their fabricated allegations will not hold up in court, and so they have engaged in delaying tactics––actions clearly intended to push off their inevitable defeat in court––hoping to exhaust the community’s resources through the legal proceedings. The legal team is confident that Kneses Israel/Chabad will win in court as soon as the case is heard. Now, Chabad is turning to you to help cover the legal fees. The community has shown its resilience in the face of adversity time and again. When Hurricane Sandy destroyed the lower level of the synagogue, they moved upstairs and soldiered on. Recently, an electrical fire wrought havoc in the upper level, forcing the community out, and the hundreds of Jewish families who enjoy services, events, and programs at Kneses Israel are currently without a building and a place to call their own. With your help, the Seagate community will once again overcome adversity, and continue to grow together as a community in our beautiful synagogue. Twenty-eight years ago, the Rebbe’s Shluchim to Seagate, NY Rabbi Chaim and Rivky Brikman, were hired as the rabbi and rebbetzin of Congregation Kneses Israel of Seagate, a synagogue with a storied past dating to 1924. The shul had always prided itself on being a place in which every Jewish resident of Seagate would feel at home, so the Brikmans’ Chabad philosophy of warmth and outreach to every Jew was a natural fit. In keeping with their mission––as shluchim of the Rebbe––the Brikmans founded a Hebrew school, adult education classes, programs for youth, teen and seniors, transforming what was a relatively small Jewish community into one that is vibrant and brimming with Jewish pride. Eleven years ago, they were approached by a Satmar Yeshiva from Boro Park to rent space in the building adjacent to the main shul. Because the shul building sufficed for the congregation’s needs at the time, they rented the space to them. Left without a home, the congregation chose not to renew their tenant’s lease on the school building after it expired. While verbally agreeing to vacate at the end of the school year, the Satmar Yeshiva reneged on the agreement, fabricating a lawsuit against the shul, the first step in what would become a pattern of deceit trying to bankrupt the shul and initializing a hostile takeover of the shul’s property. They have fabricated horrific accusations against the Shliach and Shlucha as well as the local community members. 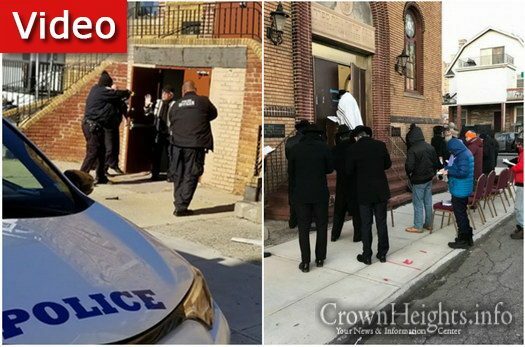 UTA of Boro Park, hired armed guards to station themselves in front of the shul to stop community members from entering. 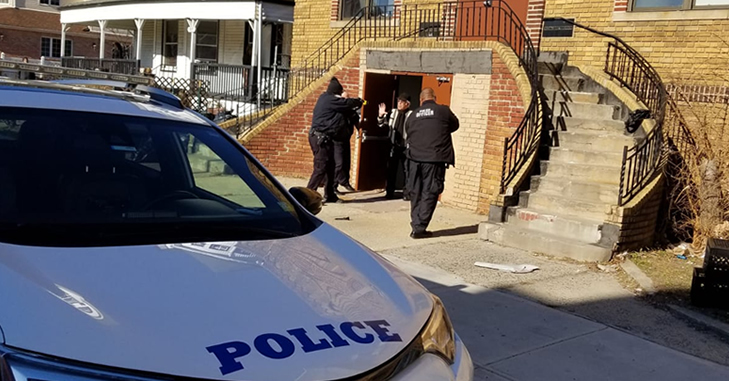 They even went as far to insist that the judge order the Shliach Rabbi Chaim Brikman be arrested for hosting a Shabbos Kiddush in the building. Detective Joe Vitella has been credited with taking down Shaya Lichtenstein, the Shomrim member who pleaded guilty in a gun-permit scandal. Vitella had been asked to testify in the trial of former Deputy Inspector James Grant who was ultimately acquitted. https://nypost.com/2018/04/26/feds-want-cop-in-bribe-string-to-testify-at-nypd-trial/. Vitella himself was not implicated and we make absolutely no suggestion that he should have been. He has retired with a string of laudatory credits to his name. But the majority of his praise comes from the Satmar community covered by that precinct. For us, what remains disturbing is the gray area that characterizes the lines drawn between the police department, the community boards and the Shomrim of Borough Park. We are concerned lest a private community be favored by a police department, not in how that department protects its precinct but in how they handle the badly behaved within that precinct. We fear that it may be the roosters running the hen-house and wonder why the Borough Park papers offered Vitella praise in painstaking detail but his retirement is really not mentioned elsewhere. We begrudge Retired Detective Joe Vitella nothing. Mazel Tov on your retirment. We do ask, who is running whom within the walls of that community and the doors of that precinct. The notion of “scholarships implies that there is money being granted to help students or young people study, become scholars. Perhaps the notion of “scholarship” in this context is for Yeshivas or other schools. Perhaps it is intended that the beneficiaries will attend a college. Perhaps it is intended that the beneficiaries will have a better opportunity afforded to them to become productive members of society. But a Scholarship Fund that does not seem to offer scholarships raises questions. And we can’t seem to add up the numbers nor can we find that this organization really does offer scholarships. We question the validity of this organization which bills itself as having a governmental affiliation. If there is a governmental affiliation, we question the plausibility of that notion and how that ties into scholarships. We question the use of monies of a not-for-profit/tax exempt entity referring to itself as a scholarship fund for anything but scholarship. Follow the trail of breadcrumbs below. In 2016, the last year for which the Shomrim Society Scholarship Fund Inc. has an available publicly filed tax return (990), there were $464,846 in Net assets (page 1) That number was up from the year before which was $459,947 in Net Assets line 22. The difference, or the increase is $4,899.00. The entity claims $11,000.00 in expenses (See Page 2 Line 4e) (which is listed as scholarships in one place and separate expenses in another) which technically means, the increase in total is $15,899.00. Under the Checklist of Required Schedules (Page 3) they answer “Yes” to whether or not the entity is a 501(c)(3) or a 4947(a)(1) entity which is then later described in Schedule A. Under the Checklist of Required Schedules (Page 3) they answer “Yes” to whether the entity has “other assets in Part X, line 15 that is 5% or more of its total assets reported in Part X, line 16” and if so there should be a Schedule D, Part IX. On Page 4, line 22 they answer “Yes” to “Did the organization report more than $5,000 of grants or other assistance to or for domestic individuals on Part IX, column (A), line 2” and if so there are schedules to be attached. Presumably, that is part of the $11,000.00 listed earlier. On line 34 they answer that the organization is related to other tax-exempt organizations (we already know the Shomrim are interconnected entities, so this is no surprise). Then on line 38 they say that there are other explanations to be added. Interestingly, and something we do not understand, there is a “funeral liaison” (Page 8). Given that this entity bills itself as offering scholarships, one must ask why there needs to be a funeral liaison. Page 9 lists losses, though de minimus in “investment income” and gross amounts of sales from “other assets”. The “other assets” listed are securities in the amount of $75,569 which had an initial basis of $79,998 (thereby indicating a loss of $4,429). But there is also $5,569 in Investment income and total revenue of $1,700.00. Page 11, otherwise known as Part X (Balance sheet) is where things get interesting. There was a beginning of the year non-interest bearing asset of $213,280.00 with an end of the year at $202,184.00. The difference is -$11,096.00. That is listed on line 1. On line 11, the Sholarship Fund lists publicly traded securities, beginning of the year $245,962.00 and end of the year $157,662.00. One would have expected that the difference would have been the -$75,569.00 number listed on page 9 – losses from securities. But the difference actually comes out to -$88,300.00. It is unclear what happened to $12,731.00 or the difference between what is listed on page 9 as losses and what is listed on Part X as losses from securities. Line 16 of Page 11 lists Total Assets of $460,047 at the beginning of the year and E/O/Y at $464,846 or a difference (increase) of $4,799.00. We think that the total liabilities line which is 26 may help to make that number match the difference of $4,899.00 on Page 1 Line 22. There is a net unrealized gain on investments listed on page 12 of $16,391 (line 5); but there was a loss in the equity position and then this intangible that seems inexplicable. Schedule A claims that the entity is a line 6 – “federal, state or local government or governmental unit” 170(b)(1)(A)(v). But aren’t the Shomrim separate from our government? Aren’t they private security entities within the communities? And, are their “Scholarship Funds” government scholarship funds? On Supplemental Schedule I “Grants and Other Assistance to Organizations, Governments and Individuals in the United States” there is nothing listed. So what happened to the $11,000.00 supposedly granted to 5 individuals. Where did that money go? And if not within the United States, why is an entity claiming to be part of our governmental entities giving money to non-US Governments or Individuals? The Grants to the 5 individuals is, indeed, listed on Page 2 of Schedule I – an award of $11,000.00 presumably pro-rata to 5 recipients. Schedule R lists two affiliated entities: 1) Shomrim Society Inc. (Cemetery) – 501(c)(13) and Shomrim Society I (Fraternal) 501(c)(4). Presumably, the money runs by and between these entities which is the extent of their affiliation. We outright question the validity of an organization that refers to itself as a scholarship fund but gives no scholarships. It liaises with cemetery organizations but, again is listed as a scholarship fund. To avoid being heartless, we recognize that perhaps this organization helped to fund the burial of 5 individuals, which could very well be. But there again, it refers to itself as a “scholarship” fund. Is Rise Up Ocean County, FB Page Anti-Semitic; and if Not Does Labeling it as Such Condone the Behavior it Criticizes? This following is being written in response to the decision to label the “Rise Up Ocean County” Facebook page anti-Semitic. We believe that decision gives credence to the behavior that has led to the creation of that page and diminishes the reality of true hatred for Jews. We admit that we do not always like what is written on that page. We do see comments by the vast audience that are sometimes unsettling in their rhetoric and the clear dislike if not hatred they impart. But we do not feel the page is anti-Semitic. We do not view the page’s commentators/administrators as anti-Semites. Rather, we know the difficulty they face crawling woefully unbalanced on the fine line between scrutinizing and condemning, being critical and being angry or expressing resentment versus hatred. The anger sometimes expressed on that page is not, as we see it, anti-Semitism. It is also not unexpected. One can be angry at members of a group that parades its religion like a badge of honor using it to extol virtue and excuse all manner of behavior, without being anti-Semitic. That was not an anti-Semitic trope. Mere mortals have an impossible task discerning between the members of that community who are some of the best human beings this world has to offer and the less palatable when both are cloaked in the pageantry of religious zealotry. And most of us are… mere mortals. Is it Anti-Semitism or is it Just Plain Criticism? And if Those Under Scrutiny Wave Their Judaism Like a Red Flag Before a Bull, are the Critical Ones Really Anti-Semites? Is the Commentary Really Anti-Semitic? Should the Flag-Bearers Not Be Accountable for the Controversies They Create While Using their Zealous Religious Observance as a Shield? IT IS NOT ANTI-SEMITISM, IT IS A DEMAND FOR ACCOUNTABILITY DESPITE ALLEGED RELIGIOUS OBSERVANCE NOT BECAUSE OF IT. Several weeks ago a famed Satmar Rabbi demanded in Jihadi-like fashion that his members disregard the laws of the State of New York with regard to the education of children. He condemned the army service required by the State of Israel and he extolled the virtues of his community. That speech was wholly anti-Gentile. It was, for all intents and purposes a demand for his people to be entirely intolerant of others. He was praising his community for its exclusion and the protections the literal walls of that community seem to offer. He did not acknowledge the criminal behavior of any of its members, nor did he even recognize that there are laws, other than those of his Satmar tenets. His speech reflected shades of Stalin, Napoleon and even the leaders of ISIS, though without the call for martyrdom and the final G-d is Great yelled by his followers. And when non-Jews look at that speech, the clothing he wears and the vastness of his following, what are they to think when the greater Jewish community is not criticizing him, is not demanding accountability? The greater Jewish community is either complacent or complicit. What comes after that is irrelevant. In fact, the Satmar who follow his tenets to the letter do not get condemned because the finances and the voting power of that community are far too vast for anyone to have the audacity to call him out. And, because condemnation is labeled anti-Semitism there is an additional very sticky risk. Rise Up Ocean County’s answer to that is unmitigated gall, not anti-Semitism, even if it is not the perfect answer. A family cannot pay for its 7 children but continues to have more children, to abundance, and then demands social services pay for those children because their father is not working; he is studying. Is that family acting responsibly and unselfishly? If you cannot pay for your own children, don’t have any more children. It should not matter if you are Jewish, Muslim, Christian Scientist or whatever. But if you so choose to have more children and you are thusly criticized or even ostracized, the fault is yours and it is you who should be held accountable. Wearing the garb of a religious Jew should not shield you from criticism. A school that supposedly educates children who cannot by graduation complete complex math problems or speak a sentence of English is not actually educating its children. It is depriving them of a future, and the rest of society productive members. It should not matter if the school is a Yeshiva, a Church or a family home-schooling its children. A certain set of standards should be met to which all parents are held accountable in a country that calls itself a Democracy, unless that Democracy wants to become a radical indoctrinated theocratic regime. The United States was founded on a principle of separations between church and state for a reason. As such, secular education should come first and religious education second so that each member of society can somehow contribute to that society. The alternative is unsustainable. That is not anti-Semitic, it is a fiscal, social and societal reality. A religious school that accepts PELL Grants, and other College Grants but does not actually offer a B.A. an Associates or any other degree for that matter is committing fraud. To criticize a Yeshiva and hold its members and financial beneficiaries who are illegally taking grant money intended for a college education, without actually offering that education accountable is not anti-Semitism. That this is happening with vast incidence within the ultra-Orthodox Yeshiva system is an embarrassment to all Jews. To acknowledge it, to target it and to raise this issue is not anti-Semitism. PELL and other college grant money is designed to allow children who otherwise cannot afford to be educated, opportunities toward a better and more productive future. Those who are doing otherwise with that money are thieves and fraudsters, whether they are Jewish or otherwise. To label someone who brings this to light an anti-Semite is to create true anti-Semitism. The owners of a private home that is converted into an alleged house of worship for the purposes of avoiding taxes are committing tax fraud. A family that has 15 children and home-schools those children and then calls the location a school is committing tax fraud if the not-for-profit tax system is used as a means to avoid taxes. The conversion of private homes into quasi Yeshivas or houses of worship (shtibles) for the purposes of avoiding taxes under the 510(c)(3) not-for-profit/tax exempt status is epidemic in areas of ultra-Orthodox concentration to the the detriment of every other member of the same community. To raise this as an alarming trend is not anti-Semitism. To say that it breeds contempt amongst those members paying their full share of taxes is not anti-Semitism. To say that it is outside of the structure of a law-abiding community is not anti-Semitic. To say that it needs to stop is not calling for the extermination of Jews. It is calling upon members within that community or those in charge of governing the society at large to make changes. And when that private home stands next to 5 other similar homes, none of which is actually a legitimate house of worship, such that the rest of the neighborhood’s taxes are increased, one would expect the neighbors paying more money to be resentful. They are being forced to give to a charity they did not choose, Jewish Zealotry. Should we not hold those members of society who are creating this unimaginable inequality as they flaunt their religious belief system to account because they are Jewish? Can anti-Semitism always be the fall-back position? A family that lives on social welfare and uses the food stamps for items not deemed covered by food stamps or uses the health benefits card to travel to the shopping mall is committing a fraud. That this is happening with alarming regularity within the ultra-Orthodox community speaks to the skewed moral compass of members within that community not those who raise the issues and condemns them. This is not anti-Semitism, nor should that term be used to shield behavior that is harming everyone. Admittedly, decent members of that same community are being held to account for their brothers and sisters. Are we not our brothers’ keepers? A school that employs its teachers partially off the books to avoid reaching the maximum earning allowed is evading taxes on every level. When the teachers then do not fully declare their income and furthermore live off welfare and social benefits as if they only earning partial income, they are committing a crime. Not only are they perpetrating a fraud but they are harming every truly needy member of society for whom the benefits are no longer available. That this is a practice institutionalized within the ultra-Orthodox community, encouraged as a growth strategy is a tragedy for every Jew and for society at large. To make that comment is not anti-Semitic it is anti the institutionalization of criminal behavior. If that behavior reflects the mindset of a particular group, then the group should be condemned, regardless of race, religion or political bend. If anti-Semitism is an unintended consequence of that scrutiny it is the responsibility of every Jewish member of society to address the problem or we must accept the outcome. A community that was once a quiet bedroom community but starts to grow and grow without actual planning for infrastructure and land-use such that people cannot get from one place to another without a car accident stopping traffic on a daily basis, is being wholly irresponsible. That this community is growing exponentially because of the “fruitful multiplication” practices within the ultra-Orthodox mindset is not an “anti-Semitic trope.” It is a reality. The exponential growth is unsustainable and needs to be curbed is not an anti-Semitic statement. That irresponsible behavior breeds resentment is the responsibility of the members of the community who act with impunity and disregard for others. Perhaps the members of that community who support this behavior and their leaders should stop making claims that their behavior is excusable because it is religiously grounded. Perhaps they should be held to the same standards as the rest of society. Perhaps the sense of entitlement needs to be met with resistance. There is no excuse for illegal, fraudulent, exclusionary, entitled or otherwise unacceptable behavior, religious or otherwise. To use religion as a shield is to insult every responsible, law-abiding and considerate Jew however he or she dresses or observes his or her belief system.